Entity Framework is now well established as Microsoft’s de-facto data access story. It has notched up 5 impressive revisions already and version 6 started of with a bang in terms of development story. Microsoft open sourced Entity Framework (version 6 onwards), the development code was available on CodePlex, they started accepting pull requests from the community and everyone had access to a nightly build as well as meeting and design notes. While this is a laudable effort given the flak MS has drawn in the past, the reassuring part about the new Development Model was that, releases were still controlled by Microsoft (much like the ASP.NET MVC framework) and the same Support Agreements as of version 5 held true for Enterprise customers who may have had concerns with the new Model. But today, we are not going to discuss the pros and cons of EF going OSS. Let’s get started and see what new customizations we can do on top of Code First conventions. This implies that we now have greater flexibility in modeling our Databases. Earlier, EF Code first, followed certain naming conventions and derived DB Names/Column Names etc. from its pre-set conventions. For example the Primary Key was expected to be EntityName+’Id’ or just ‘Id’. We could always override them by putting the override via attributes wherever we wanted. But if we wanted to do bulk overrides, we had no option but copy paste. Boring! The –pre tells Nuget to look for pre-release versions and get the latest one around. Now as we can see, it has a weird Key with a Pk prefix. Well that’s what our DBA will permit so that’s what it’s gonna be. Imagine this across a more elaborate schema and adding the [Key] attribute for it is not a very enticing proposition. 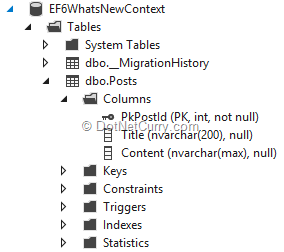 Thanks to the new capabilities in Entity Framework 6, we can now ‘tell’ EF that all properties starting with Pk are going to be Primary Key columns. To do this, we have to override the OnModelCreating method in our DbContext. But we haven’t created one yet! Since we started off with an ASP.NET MVC application, we can usually build the application and then scaffold a new PostsController that uses EntityFramework. 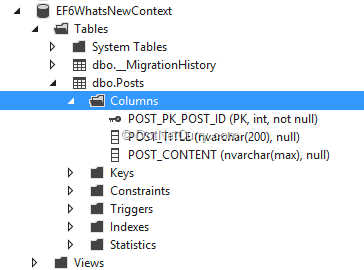 This will generate the DB Context, which in case of this example is called EF6WhatsNewContext. But in our case, as soon as we hit Add, we’ll get the following! Oops, if you are not following EF specified default conventions, no cookies for you from the scaffolder. So we’ll reset the PK to PostId and Scaffold the Controller. Then change the ID back to PkPostId. Don’t forget to update the scaffolded views to use PkPostId in the Html Helpers as well, else you’ll get errors at runtime. 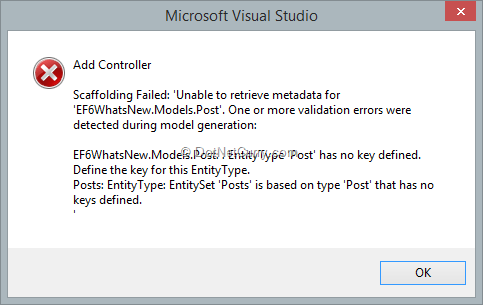 Apart from the standard constructor and the DbSet property for Post, we have overridden the OnModelCreating method. Here from the modelBuilder, we’ve pulled out all the Properties() in the model. 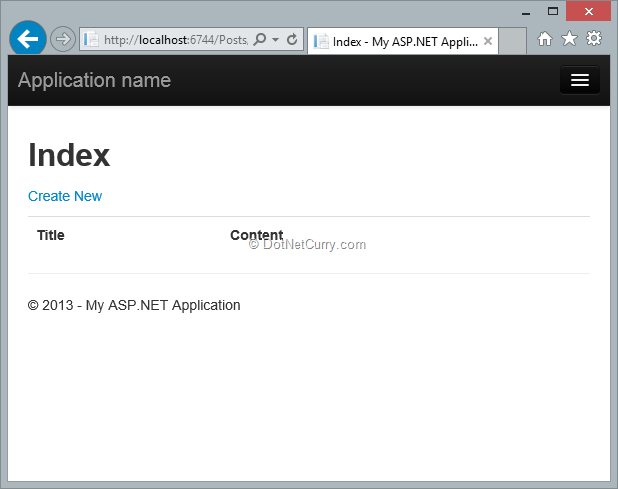 This Properties() API is new. On this list of properties, we’ve applied a Where clause that gives us the reflected details of the Property/Column name. We picked the Name property and checked to see if it starts with Pk. Once we have all the properties, we use the Configure method and define the property is the key by calling the IsKey() function. If we build the application now and try to scaffold, it will succeed. If we run the application now and navigate to the /Posts page, we’ll see an empty Index page. As we can see here, the PkPostId is now setup as Primary Key. From the above diagram however, we see that the Title and Content are both set to nvarchar(max). We know our DBA is going to throw a hissy fit if they see this. We can devise a convention that says anywhere in the Schema if we have properties like Name, Title, Email the length should be limited to nvarchar(200). Content can be nvarchar(max). This states that any column name of type string containing the words Title, Name or Email will have a max length of 200. This will setup the initial state of the DB. Next we’ll ask EF to scaffold out the changes with respect to the new Property rule we added. Now if we go back to the DB in the Explorer, we’ll see the Max length has been set appropriately. 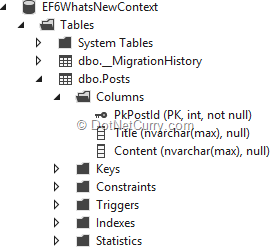 Imagine Halfway down our project, our DB experts do a DB review and reject the column naming convention altogether. They want column names to be prepended with the table name, all UPPER case and each Word in the name should be separated by underscore. So Post.PkPostId should be POST_PK_POST_ID (Okay, okay that’s a weird and unlikely requirement, just play along to see how we get to it). This method takes in a propertyInfo, uses it’s name to generate a string that separates out the Pascal case (or dot separated) words and joins them with underscore. Finally it converts the whole thing to upper case and returns it. Pretty neat! That introduces the Code First Convention features in the upcoming Entity Framework 6. There are tons of more features that we’ll cover as we get closer to final release and beyond. With the Code First convention enhancements, configuring conventions has become much easier using the Fluent API. This will reduce a lot of repetitive work and a ton of attribute clutter if your DB conventions don’t matchup with EF defaults. 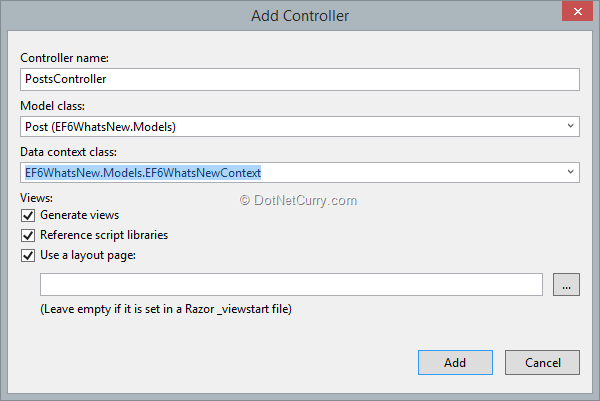 why modelBuilder.Entities()is not working in EF 6 RC? What I did, I reinstalled the EF 6 Beta through Nuget, and it gave me this error: "One or more packages could not be completely unistalled: EF6.0.0-beta1. Restart VS to finish unistall"
That should update your packages to RC1. The code sample works with RC1 too.